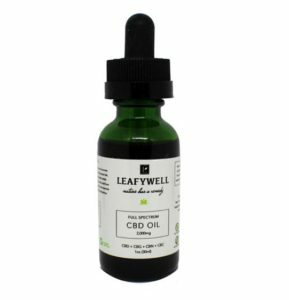 CBD hemp oil by Leafywell is unique to the market in the way it combines a multitude of a helpful ingredients. It uses 2 types of Raw Hemp Oil. Raw CBD Hemp Oil is full of cannabinoids such as CBD, CBG, CBN, and CBC. These cannabinoids work together to offer your body a more balanced raw CBD hemp oil. Both of the CBD hemp oil’s are local and have a full spectrum of cannabinoids. They test slightly higher in cannabinoids like CBN or CBC. CBD Isolates are mixed in to add more strength at a more affordable price. A blueberry flavor is also offered.